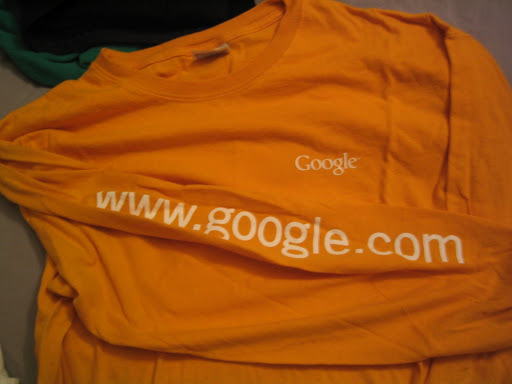 Continuing the “Google Gear associated with CES” stories, here’s a long sleeve t-shirt that us booth babes, err staffers, were given to wear. They came in red, blue, green and yellow, each corresponding to a specific section — mobile, search, community and, uh, hmm, maybe media, i don’t really remember. Google traditionally doesn’t do the “big booth thing” and I was kinda surprised by our presence here. It’s probably because we displayed at a Digital Life conference in NYC and there was some sunk cost is getting the booth built. Anyway, it was neat with giant Lego pieces.